Just 8 miles southwest of the Niobrara State Park at Niobrara, Nebraska, awaits a fun filled, family loving, educational tour that will put you as close to an elk or buffalo as you can get without hoppin' on and goin' for a wild ride! With each season bring a new and exciting experience. The spring and early summer is calving season and boy is it fun to see the baby elk and buffalo calves frolicking around in the green grassy pastures. The little elk calves, with their little white spots, peep to their mommas and the light brown buffalo calves grunt to their mommas. A bull elk will start to grow his new velvet antlers in the early spring so the start of our tour season will show you the mid-growth of the fastest growing membrane known to man. The beautiful changing fall leaves along the scenic Niobrara River Valley is a picturesque view from the top of the hills in our elk and buffalo pastures. The fall brings a new tour with the elk and buffalo going into their mating seasons. If you have never heard the mating call or the "bugle" of the majestic bull elk, you are missing out! It's an awesome sound that you'll never forget. Oh, did I mention the gigantic elk antlers these critters can grow? In 2012 our 4 year old herd bull elk scored a 466 according to the boone & crocket scoring system. We don't want to leave out the sight of a 2000 pound buffalo bull coming up to the side of the wagon wanting to get some ear corn, in which you get to feed him by hand. Yeah, he's so close you can smell and feel his breath. The buffalo bulls are not the only animals you hand feed, oh no, the cows get right in there as well as our long-horn steer named Boomer, who lives with the buffalo. In the elk pasture Suzie our pet cow elk comes running for the wagon and loves to have her ears scratched. We can't wait to share with you our fun and educational experience of our covered wagon tours. All we request from you is a simple phone call to 402-857-3850 or 402-841-2754 or email us at kreycikelkranch@yahoo.com to make a reservation. We begin giving tours to the school kids in the early spring for field trips. Our regular season begins May 18th, 2019 and continues to September 29th, 2019. Tours run on Saturdays at 10:00am and 2:00pm or Sundays at 2:00pm. We do offer tours during the week for groups of 10 or more. Copyright © 2019 Kreycik Elk & Buffalo Ranch. All Rights Reserved. 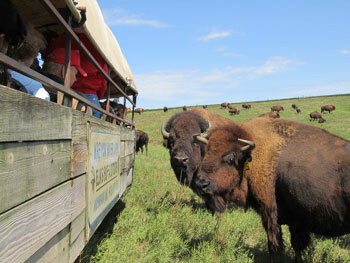 For Tour Reservations call Chris at 402-857-3850 or Stacy at 402-841-2754.